Ski-in/ski-out condo with wonderful outdoor covered patio. 2 bedrooms + loft, 2 bathrooms, sleeps 6. Views! It just doesn't get any more convenient than this condo at Columbine. Situated at the top of the hill overlooking the ski resort with SKI-IN/SKI-OUT access you are in the midst of all the activity during the day and perched on top of the world with INCREDIBLE views at night. This 2 bedroom, 2 bath, plus a loft unit was remodeled recently and couldn't be more comfortable. Upon entering the unit you can't help but feel warm and comfortable with the easy layout accommodating up to 6 people. When you first walk in your eyes will be drawn to the towering windows overlooking the resort. 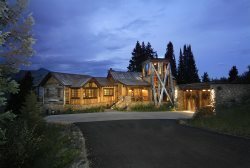 The open kitchen, dining and living room is perfect for enjoying the down valley views of the Elk Mountains. Off the living area is a large patio to enjoy a summer meal or try to pick out your friends as they ski to the base area. On the same level is a king bed in the master bedroom with en-suite bathroom, a queen bed is in the 2nd bedroom, and another full bathroom is just off the kitchen.Up the easily navigated staircase is a set of twin beds in the loft are. After a hard day on the slopes or a leisurely hike you can relax in the hot tub or grill out on one of the gas grills in the common area. Or better yet, sit on the patio furniture for 6 right off the living room on the outdoor covered deck. (The only one of it's kind at the Columbine!) Sitting in the OVERSIZED HOT TUB at night and overlooking the lights of the resort and town is one of the best ways to unwind and enjoy your Crested Butte vacation. With accommodations like this, you may never want to leave! In the winter, walk down one flight of stairs, snap into your skis, and glide down to the Red Lady or Silver Queen lifts. It's beginner to intermediate terrain from the condo to the base area so having the kids ski down to ski school is no problem. In the summer, you've got the exact same access to the best mountain biking and hiking trails of Mt. Crested Butte. Beautiful property. Everything about our stay was easy and top notch. Beautiful condo, with fantastic view, comfortable beds and perfect location!! Will definitely come back. We received a call just as we pulled in that the washer wasn't working and that they would bring a roll of coins for use in the complex laundry room. Then next day, they brought the roll of coins and promptly had the washer in the unit repaired. They were very informative and helpful! Our stay was wonderful. Everything was very clean and functional. Our girls loved staying in the loft, and the ski-in ski-out location was very convenient, although skiing out for a first-time skier was a little tricky! We had a great time, and the condo was the perfect place to relax at the end of the day. We always had a friendly fox to greet us in the afternoon. Very friendly kind and efficient. The Iron Horse team is outstanding. They are friendly, conscientious, and want nothing less than excellence in their service. We are interested in purchasing an investment property in the area and the Ryans and Molly spent an hour in person helping us with the details of what that would entail plus more time amassing information for us on the specific properties in which we are interested. We really appreciated their time and effort. Thanks Jennifer, Steve, and Molly! The Condo was perfectly located for what we wanted to do on our vacation. I rode my mountain bike right from the condo to the many trails in the area, we walked to dinner on several occasions, or hopped in the car for the short drive to town or to the hiking trails nearby. It was no big deal to walk to town either. The beds were comfortable and the neighbors were friendly. We couldn't ask for more. The staff at Iron Horse are great to work with and are very friendly. They find you the best accommodations. The location of the condo is excellent. Love looking out and seeing the ski area. The kitchen is well equipped and the master bathroom is very spacious. Will book it for summer vacation! Very helpful and professional. Great Information sent to us prior to the stay. Good instructions for checking in. Useful brochures on CB in the unit. Responded quickly to issues with helpful maintenance service men. We won't be using Iron Horse for future rentals because we bought a unit in Mt CB! Since we have had such great experiences in renting through Iron Horse two times, we want to use Iron Horse as our property management team. We look forward to this partnership. We recently stayed in two different properties and we were very pleased with both of them. The Iron Horse team was extremely helpful and each person we worked with couldn't have been more friendly and knowledgeable throughout the whole process. Our stay in Mt. Crested Butte was absolutely "OVER THE TOP"! Our thanks to EVERYONE involved! We look forward to coming back SOON!! The original property I wanted was unavailable, but the team member was quick to find a suitable alternative and made the entire process - check in to departure - seamless and wonderful. What a perfect place to escape the Oklahoma heat! This condo was extremely clean and well appointed. The views were to die for and the kids loved the fact that hiking trails were right outside the door! We will definitely be back! *Parking passes will be provided for 2 vehicles.